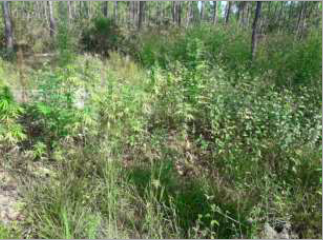 Abaco, Bahamas - Reports are that on Wednesday 19th September 2018, shortly after 4:00pm, officers in the Abaco District, acting on information, proceeded to an area on Earnest Dean Highway, just south of the International Airport, where they discovered a large marijuana field with marijuana plants ranging from 1 ft. to 7 ft. in height. The plants were all uprooted and collected. The total count of the plants are 387 plants, with a street value of $154,800.00. There were no arrest made in this matter and police are actively investigating.